Asian stocks rose, paring the MSCI Asia Pacific Index’s biggest weekly decline since March, as better-than-estimated U.S. economic reports boosted the dollar and Goldman Sachs Group Inc. upgraded Japanese banks. The MSCI Asia Pacific Index gained 0.7 percent to 101.30 as of 3:27 p.m. in Tokyo, with two stocks rising for each one that fell. The gauge has lost 3.7 percent this week, paring its rally from a five-year low on March 9 to 44 percent. The index is down 41 percent from its November 2007 record. Japan’s Nikkei 225 Stock Average rose 0.9 percent, led by industrial-plant builder Chiyoda Corp., which rose 3.3 percent after the Nikkei newspaper said the company won an order in Saudi Arabia. Elpida Memory Inc. jumped 3.3 percent after the Nikkei said the company may apply for funding from the Development Bank of Japan. Citic Securities Co. climbed 3 percent, leading China’s brokerages higher, after Guilin Sanjin Pharmaceutical Co. became the first company since September to get approval to sell stock. Hong Kong’s Hang Seng Index rose 0.6 percent, while Singapore’s Straits Times Index climbed 1.4 percent. Futures on the Standard & Poor’s 500 Index rose 0.2 percent, while Treasuries advanced as rising yields lured some investors. The S&P 500 climbed 0.8 percent yesterday as the New York- based Conference Board said its leading economic index rose 1.2 percent last month, exceeding the 1 percent gain estimated by economists. The Federal Reserve Bank of Philadelphia’s general economic index jumped to the highest level in nine months. The World Bank yesterday raised its forecast for Chinese economic growth, while Japan’s central bank upgraded its assessment of the country’s economy on June 17. Optimism that the global economy is recovering helped drive the MSCI World Index’s 39 percent rally from a 13-year low on March 9. The MSCI Asia Pacific Index’s decline this week, the first in five, came after the rally since March drove the average valuation of companies in the gauge to 1.5 times the net value of assets as of the end of last week, the highest level since Sept. 26, according to Bloomberg data. “Valuations have risen, though companies’ expected recovery in the second half is far from certain,” said Minoru Takada, chief fund manager at Mitsubishi UFJ Asset Management Co., which oversees the equivalent of $52 billion in Tokyo. Companies in the measure trade at 23 times estimated net income, higher than 15.5 times for the S&P 500 Index and 12.8 times for Europe’s Dow Jones Stoxx 600 Index. 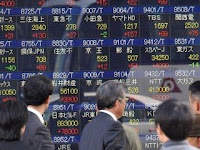 Canon jumped 4.2 percent to 3,230 yen as the yen depreciated to as weak as 96.85 per dollar today from 95.88 at the 3 p.m. close of stock trading in Tokyo yesterday. A weaker yen boosts the value of overseas sales at Japanese companies. Sony Corp., an electronics maker that gets a quarter of its sales from the U.S., gained 2 percent to 2,525 yen. Howard Stringer, the company’s chief executive officer, told shareholders today that the company is “seeing steady progress” on a cost-cutting plan. WorleyParsons rose 5 percent to A$24.13 after forecasting growth in fiscal 2009 and said contracts it won recently will support earnings in the 2010 financial year. The company also said it signed two nuclear power plant contracts in Egypt. Chiyoda rose 3.3 percent to 790 yen in Tokyo after the Nikkei reported the company won a 100 billion yen ($1 billion) order in Saudi Arabia with Samsung Engineering Co. Seoul-based Samsung Engineering lost 1.4 percent to 83,800 won. “Japanese banks should enjoy an outsized earnings impact from lower credit costs as the economy stabilizes, and the recovery in stock prices should also help alleviate capital concerns,” Kathy Matsui, Goldman’s chief strategist in Tokyo, wrote in a report. Matsui recommended hedge fund investors to buy banks and fund the purchase by short selling steelmakers. Commodity shares rose, following gains in oil and metals prices yesterday. Mitsui & Co., which gets more than half its profits from commodities dealing, gained 3.5 percent to 1,179 yen. Woodside Petroleum Ltd., Australia’s second-largest oil producer, added 2.7 percent to A$41.61. Materials producers are the best performing of the MSCI Asia Pacific Index’s 10 industry groups in the past month amid optimism a global economic recovery will spur commodities demand. Jiangxi Copper Co. dropped 2.2 percent in Hong Kong to HK$12.34. Zhejiang Honglei Copper Co., which buys material from Jiangxi Copper, said the State Reserve Bureau is likely to end purchases of copper amid weak demand, causing the metal’s price to fall. Copper futures in New York dropped 0.9 percent in trading today. Elpida, Japan’s biggest maker of memory chips, climbed 3.3 percent to 1,069 yen. The company may seek as much as 40 billion yen ($416 million) by selling up to 30 billion yen in preferred shares and borrowing a maximum of 10 billion yen from the Development Bank of Japan, the Nikkei newspaper said, without saying how it got the information. The report isn’t based on any announcement from Elpida, the company said in a statement today. It said earlier this year that it was considering applying for public funds. Citic rose 3 percent to 29.60 yuan in Shanghai. Haitong Securities Co., China’s No. 2 brokerage by market value, gained 2.3 percent to 17.21 yuan. Sanjin Pharmaceutical said it will start marketing its share sale and seek a price on June 22, marking China’s first initial public offering since the government halted share sales in September. “Brokerages are direct beneficiaries of the resumption of new share sales, which will bring an additional revenue source,” said Wang Zheng, a fund manager at Jingxi Investment Management Co. in Shanghai.